Dr Shin Sugiyama and his colleagues at Hokkaido University in Japan study the shrinking glaciers near the village of Qaanaaq in northwest Greenland, where local people are reliant on hunting and fishing. His team’s analysis shows that glaciers in the area have shrunk (or ‘retreated’) in recent years due to increasing melting and calving (shedding of ice chunks). Their further work centres on the outflow of glacier meltwater into the fjords, which causes deep, nutrient rich, ocean water to upwell to the ocean surface, supporting marine life. Under the influence of a warming climate, the Greenland ice sheet has been shrinking at an increasing rate since the 1990s. As well as contributing to sea-level rise, this has the potential to seriously impact on the local marine environment. Dr Shin Sugiyama and his colleagues at Hokkaido University have conducted studies quantifying the rate of ice loss at several sites in Greenland, as well as studying the impact on the local ocean environment. Much of Dr Sugiyama’s research has focused on the Bowdoin Glacier, which is located at the head of a fjord 30 kilometres northeast of Qaanaaq. In a 2015 study, Dr Sugiyama and his colleagues found that the Bowdoin Glacier had retreated rapidly over the preceding years. By analysing satellite images of the glacier obtained in the period between 1987 and 2013, the team compared the position of the front of the glacier nearest the ocean to its 1987 position. The researchers found that the glacier remained roughly the same size between 1987 and 2008, with the exception of a 230-metre retreat between 1999 and 2001. However, at some point between July of 2008 and June of 2009, the glacier began to melt rapidly. It shrank by an average of 220 metres per year between July of 2008 and September of 2013, although the rate of retreat decreased in 2011 and increased again in 2012, and it was not uniform across the width of the glacier. Glaciers are formed from the accumulation of many years of snow, which becomes compacted and transforms into solid ice. This solid ice is capable of slowly deforming and sliding, and the glacier flows down the valley like a river due to gravity. 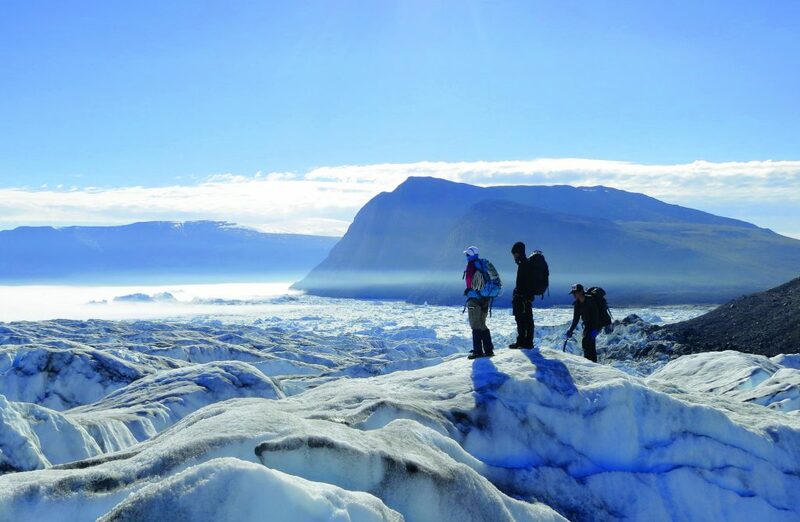 The researchers found that the rate of this ice flow at the glacier outlet, where the glacier flows into the fjord, increased by more than 100% several years before the periods of rapid shrinking. In total, the western margin of the glacier shrank by a massive 2 kilometres between 2008 and 2013, but the retreat was less than 500 metres at the eastern margin. This glacial retreat is consistent with the atmospheric warming observed in the region. In a further experiment, the team measured the shape of the seafloor in the fjord near the glacier front, and found that it also played a critical role in the rapid retreat and acceleration. Subsequently, Dr Sugiyama and his colleagues looked at 19 separate glaciers in the same region and found that they had retreated by 30 metres per year on average between 2000 and 2014. This study centred on Prudhoe Land in northwest Greenland, using satellite imagery collected between 1987 and 2014. All 19 glaciers shrank, with the rate of retreat ranging from 12 to 200 metres per year between 1987 and 2014. Five of the glaciers retreated by more than a kilometre over the study period. The ice loss began in earnest after the year 2000, with the rate of retreat increasing from 3 metres per year in the late 1980s to 40 metres per year by the early 2010s. The researchers also calculated the speed of glacial flow from the glaciers into the sea. Locations with more rapid acceleration of glacial flow experienced more rapid ice loss over the study period. Again, the researchers were able to link the onset of the glacial retreat to the fjord bed geometry as well as to atmospheric warming. Glacier loss has the potential to seriously affect marine life through its impact on the nearby ocean water, by disrupting ocean circulations and critical nutrient supplies. In a study aimed at understanding the glacial flow from the Bowdoin Glacier into the fjord, Dr Sugiyama collaborated with Dr Guillaume Jouvet from ETH Zurich, Switzerland. They used a drone equipped with an onboard camera to observe the flow of the ice near the so-called calving front of the glacier. The calving front is the point at which the glacier meets the sea and sheds ice ‘calves’. By understanding the flow of the ice in this region, the researchers hoped to work out how changes to this process are affecting the marine environment and aquatic life. 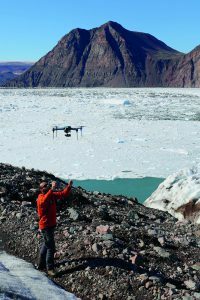 The researchers carried out two drone flights per day over a 13-day period, always following the same route over the glacier’s calving front. The velocity of the ice at various locations was deduced from the images taken by the camera. The glacial flow averaged at around 1.5 metres per day, but at one stage there was a remarkable speed up to 2.6 metres per day over a 2-day period. This was more pronounced at the southeast side of the calving front. Short-term acceleration in glacial ice flow can be caused by a number of factors, including additional meltwater at the base of the glacier leading to a reduction in friction, or a calving event causing a rapid change in the force acting on the glacier. This event is similar to one previously observed on Store Glacier in western Greenland after heavy rainfalls and high melt rates. The speed-up event at the Bowdoin Glacier happened after a warm period and prior to major meltwater discharge, and was probably caused by an increase in meltwater underneath the glacier or the collapse of a supraglacial lake. Discharge of glacial freshwater into the ocean below the surface of a glacier is likely to affect nutrient transport and therefore marine life. In order to understand the effects of such subglacial freshwater discharge on nutrient transport, Dr Sugiyama and his team carried out further observations at Bowdoin Fjord next to Bowdoin Glacier. The results showed that a plume of water upwelling at the water surface near the glacier contained significantly higher concentrations of nutrients and dissolved inorganic carbon than the surrounding water. This was due to nutrient-rich deep fjord water upwelling along with the glacial discharge. This caused phytoplankton blooms, which the team observed near the boundary between the upwelled deep water and the fresh surface water. Phytoplankton are important to the local ecosystem, supplying energy to animals higher up the food chain. This study confirmed that subglacial freshwater discharge plays an important role in the availability of nutrients, and on subsequent phytoplankton blooms, in the Bowdoin Fjord. This raises the question of how these processes will be affected as climate change affects the rate of freshwater discharge from glaciers. In a further study, Dr Sugiyama worked with marine biologists to collect and analyse samples of zooplankton (small animals that drift in the ocean) at the sea surface in the Bowdoin Fjord. The researchers carried out observations on a boat during a 3-day period in the summer. They took temperature and salinity measurements at 44 locations in the fjord, from the edge of glacier to the open sea near the edge of the fjord, focusing on the discharge plume of freshwater originating from the glacier. They then took zooplankton samples using a net at 15 locations covering a similar area and analysed them in the lab. Different species dominated in different areas of the fjord. In the outer fjord, jellyfish dominated the samples, large zooplankton called chaetognaths and copepods were most common at the centre of the plume in front of the glacier, and barnacle larvae (cypris) dominated in the middle of the fjord. The large zooplankton are likely to have been transported from the outer fjord through layers of bottom water, and then upwelled by the plume near the calving glacier. These large zooplankton contain more nutrition than the other two groups, so the inner fjord would therefore be a good feeding ground for fish and seabirds. Dr Sugiyama’s work shows that the upwelling of bottom water by the glacial plume is hugely important to the local marine ecosystem, and therefore to local people who depend on hunting and fishing for their livelihoods. It is important to understand these processes because they may become seriously affected by the increasing amounts of meltwater discharge due to climate change. Dr Sugiyama’s work is therefore crucial to understanding the impact of climate change on marine life and human activity in Greenland. ‘Now, we are on the way to connect our natural science to a sustainable future of human society in Greenland,’ says Dr Sugiyama. To help people to prepare for the future, Dr Sugiyama and his colleagues hold meetings with local communities to share the implications of their research findings and to exchange ideas. The team’s community work first started when they began working with a local hunter in Qaanaaq called Toku Oshima. Toku’s father is a Japanese man who moved to Greenland over 40 years ago. ‘We started our collaboration when Toku helped our ocean measurements by allowing us to use her boat,’ explains Dr Sugiyama. 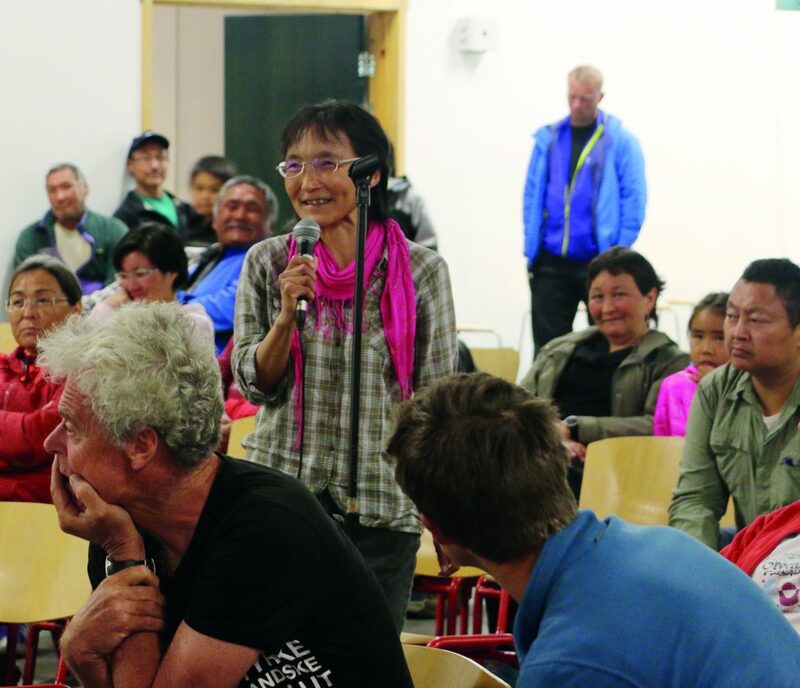 ‘She became interested in our research because changes in ocean conditions and marine ecosystems are extremely relevant to her fishing and hunting activities.’ Dr Sugiyama further explains that Toku is famous in Greenland for being one of the country’s best hunters, and for her contributions towards preserving Greenlandic traditions. Dr Shin Sugiyama gained his undergraduate and master’s degrees in Material Physics at Osaka University in Japan. He worked as a research engineer at Shinetsu Chemical Co. Ltd., before studying for his PhD in Earth Environmental Science at Hokkaido University. 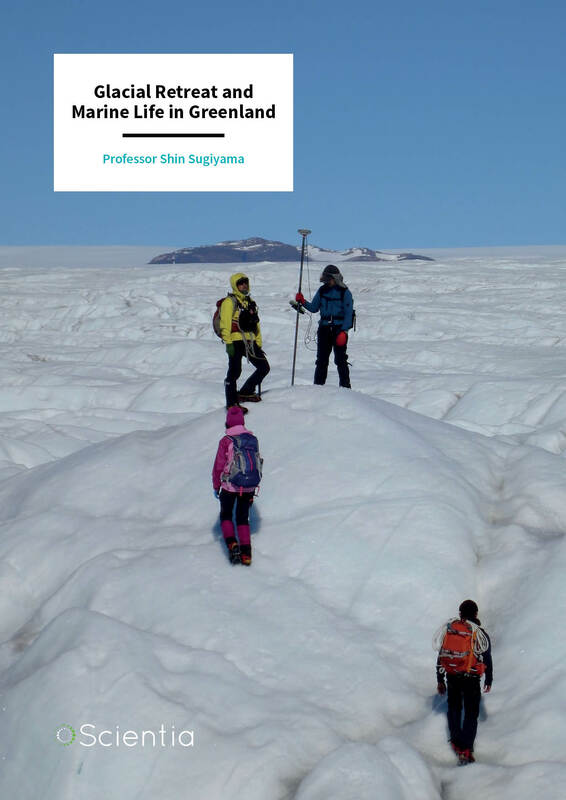 After his PhD studies, Dr Sugiyama relocated to Switzerland to conduct research into mountain glaciers at the Swiss Federal Institute of Technology. He then returned to Hokkaido University, where he is currently a Professor in the Institute of Low Temperature Science. His team’s research focuses on glaciers and ice sheets as well as their interactions with the ocean. In particular, he focuses on glaciers in Greenland, Antarctica and Patagonia, where he has carried out extensive field work. 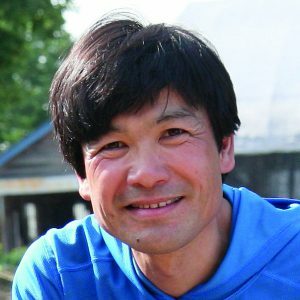 Dr Sugiyama has served as the Vice president of the International Glaciological Society, and as a scientific editor for both Frontiers in Earth Science and Annals of Glaciology. 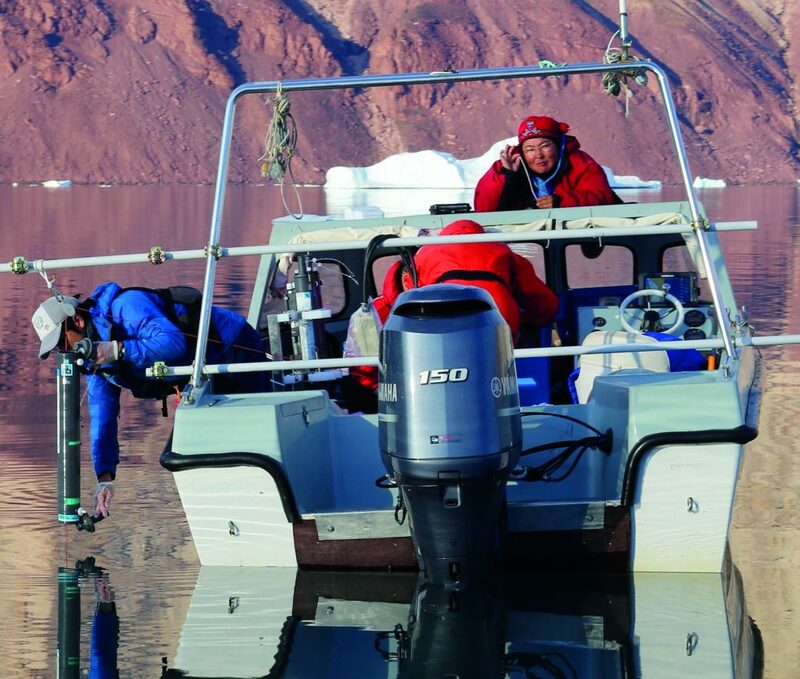 A Naito, Y Abe, K Matsuno, B Nishizawa, N Kanna, S Sugiyama, A Yamaguchi, Surface zooplankton size and taxonomic composition in Bowdoin Fjord, north-western Greenland: A comparison of ZooScan, OPC and microscopic analyses, Polar Science, 2019, DOI: 10.1016/j.polar.2019.01.001. D Sakakibara, S Sugiyama, Ice front and flow speed variation of marine-terminating outlet glaciers along the coast of Prudhoe Land, northwestern Greenland, Journal of Glaciology, 2018, DOI: 10.1017/jog.2018.20. G Jouvert, Y Weidmann, M Kneib, M Detert, J Seguinot, D Sakakibara, S Sugiyama, Short-lived ice speed-up and plume water flow captured by a VTOL UAV give insights into subglacial hydrological system of Bowdoin Glacier, Remote Sensing of Environment, 2018, 217, 389–399. N Kanna, S Sugiyama, Y Ohashi, D Sakakibara, Y Fukamachi, D Nomura, Upwelling of macronutrients and dissolved inorganic carbon by a subglacial freshwater driven plume in Bowdoin Fjord, Northwestern Greenland, Journal of Geophysical Research: Biogeosciences, 2018, DOI: 10.1029/2017JG004248. S Sugiyama, D Sakakibara, S Tsutaki, M Maruyama, T Sawagaki, Glacier dynamics near the calving front of Bowdoin Glacier, northwestern Greenland, Journal of Glaciology, 2015, 61, 226, 223–232.